I have been dabbling with calve compression sleeves for the past few years while running marathons and ultramarathons. I am not sure that I have empirical data, but since I started using the calve sleeves, I have had better muscle recovery and no calve cramping while racing. The only challenge was that I needed to wear a compression sleeve and running socks. 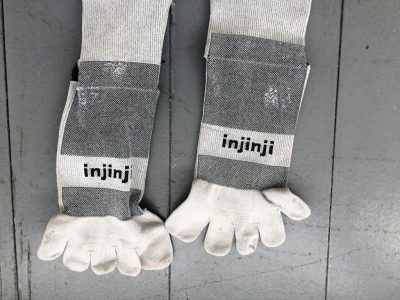 Injinji has come out with a compression sock that I hope can do both. I will be reviewing the Injinji Ultra Compression OTC socks over the next few months. Injinji is a California based company that was formed in 1999. They are unique because they have designed toe socks versus traditional socks. Their socks have little pockets for each toe that is supposed to help prevent blisters. I have been wearing Injinji socks for several years and I am an admitted fan of their socks. The Injinji Ultra Compression toe sock is a seamless, 200 needle count sock made from 80%Nylon and 20% Lycra fabric. In addition to all the features that Injinji socks are known for such as moisture wicking fabric, total foot utilization and blister prevention; this particular sock features additional support in the arch and has reflective strips on the back of the sock to help be seen better at night. The sock also has graduated compression. Injinji does not specify how much compression the socks provide. The socks retail for $49.00. As I mentioned earlier, I wear Injinji socks regularly so, I popped these out of the packaging and ran a 5k. The socks felt amazing and my run went well, but there are some noticeable differences between these socks and other Injinji’s I have worn. The first is the graduated compression makes them a bit more difficult to put on. The compression keeps the sock from expanding so I find that I need to bunch them up to the foot and get my toes situated before pulling the sock all the way up. The next thing that stood out was that the socks are really tall. I am 5’6” and have pretty average length legs, but the medium socks which are the correct size for my US men’s size 9 foot easily came up several inches above my knee. This is not a big deal I just pushed the excess fabric below my knee, but I want to point out that the socks are really long. The final difference is the compression. Other than the three differences, the socks fit and feel like traditional Injinji socks. The compression is noticeable while wearing the socks, but not uncomfortable and really once I started running, I did not notice the socks at all. They became an extension of me. 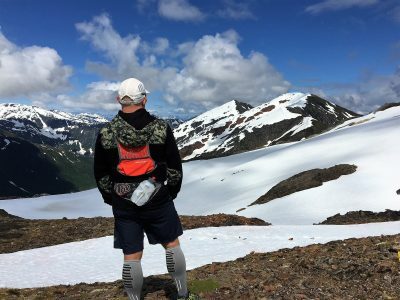 I have several marathons and ultra-marathons coming up this summer as well as a trip to Alaska to visit friends and play in the mountains. I intend to use these socks on all my adventures over the next couple of months. When I review socks I look for several characteristics. First, are they comfortable? Do I like wearing them? Is the compression noticeable or bother me in any way? Does the compression aspect keep the socks up over my large calves? Are there any noticeable benefits to wearing the compression socks versus traditional socks? Can I wear them for multiple days without them stinking? The second thing I look for is durability. Do the socks show any wear areas after use? How do the toe sleeves hold up? Finally, how do the socks do with moisture management which is the key to not getting blisters? Do they wick sweat away from my feet? Do I get blisters between my toes? These socks have been put through the wringer the past few months. I have used them while running and hiking here in the Southeast, including the Hotter than Hell, Dusk to Dawn 12 hour race that featured temperatures in the 90s and with unbearable humidity, while running in Alaska with temperatures in the 50’s and compact and slushy snow. I also used them while running the Rock and Roll Half Marathon in Seattle with temps in the 60s and overcast conditions. Overall, I have put 174 miles on the socks. I generally evaluate socks on two main criteria – comfort and durability. The Injinji Compression socks are very comfortable, once they are on. I was hoping that my difficulty putting them on would subside once they had a few miles on them, but I was wrong. They are still a pain to put on. I have probably run close to 1000 miles in toe socks so I am no stranger to putting them on, but I honestly struggle when deciding if I want to wear these. The compression in the foot is so tight that really have to work hard to get them on and that is while sitting on a stair step with dry feet in the air conditioning. I would not even try to put them on if I was switching socks in the middle of an ultra when my feet were sweaty and dirty. That being said, once they were on they were great. The compression is good, it never felt stifling or too much. When I ran the Hotter than Hell race I never felt the need to change my socks even though it was humid and hot. One trick I did at the race was I would stuff ice in my socks on my calves to try and stay cool. The compression ensured that the ice stayed put. I had a similar experience while running in the cooler weather in Alaska. Our route was off trail up and down snow covered valleys. The socks were soaked but never became uncomfortable. 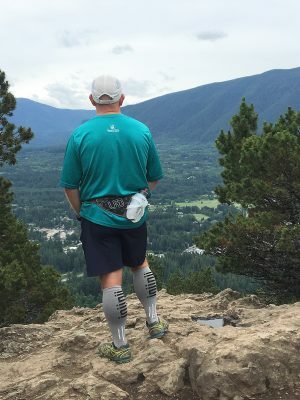 I know that compression is not the only thing to prevent cramps, good hydration plays a roll, but I did not have any cramping in my calves or feet. I also struggle with long socks, because my calves are large. Long socks normally stretch and won’t stay over my calves. I have not had this issue with these socks. Once I pull them up and put them in place, they stay there. I have not experienced any slipping which is honestly a first with any sock. A final aspect of comfort is smell. I have been pleased that they really don’t hold any funk. The only issue I have found is that they start to get pretty stiff after running in them multiple days in a row. My next criteria is durability. After 174 miles the socks are in pretty good shape. However, I am noticing some wear in the ankle area where the cuff of my shoe sits. I am not sure where this came from but my guess is that it may have come from the Alaska run where I was postholing quite often and maybe the abrasiveness of the snow caused it. I would like to think it was not from my shoe rubbing against the sock. Regardless it is an area to watch. Wear spots beginning to form on the socks. No other aspect of the sock has shown any wear. The toe sleeves and the area between the toe sleeves look like they did when the socks were new. Also there does not seem to be any wear in the heel or under the ball of my foot. I am also happy to report no blisters from my toes rubbing against each other in the sock even when the socks have been completely soaking wet. I still body glide each toe for long runs before I put the socks on. I have had some blisters over the past few months,Final but it was because of some weird toe rands and kicking the front of my toe box that I don’t attribute to the socks. Overall the socks definitely perform well, when I get them on. Like I mentioned they are a pain to get on and a pain to get off. Other than this complaint I don’t have anything negative to say. I will continue to run in the over the next several weeks to see if the wear spots become an issue. Thanks for reading my update. The last couple of weeks have been filled with racing without much down time. Since the last update I ran the New Hampshire Marathon on a Saturday and the Maine Marathon the next day on Sunday. In addition, I ran the Danimal 50k in Lake Charles, LA. Temperatures in New England were perfect in the upper 50s and lower 60s. There was light rain for the New Hampshire race and gorgeous sunshine in Maine. The temperatures in Lake Charles started in the 60s and rose to the mid-80s. There were off and on rain storms and thunderstorms during the last half of the race that made the root filled technical trails into muddy root filled technical trails. Overall I have used the socks for 260 miles of hard use! My two criteria as discussed are comfort and durability. Comfort has remained great. The socks have loosened up just a hair so that I can put them on more easily prior to starting a run. I would still be hesitant to try and put on the socks in the middle of an ultra where I am dirty, grimy and tired. The socks were soaked during the Danimal 50k due to off and on rain storms, and they continued to perform well. I didn’t feel uncomfortable, but I did develop blisters on my big toes. I don’t think this is the socks’ fault, and I did use Body Glide as is my normal practice. I think the issue on one foot was that the shoe was just a bit too loose. Durability has been pretty good as well. I have noticed a few more pulls, and some pilling inside of the toe sleeves, but I don’t think this is anything other than a cosmetic issue at this point. I am most impressed by the compression and how well it has continued to work after 260 miles. Once the socks are pulled up, they stay up over my calves with no adjustments even after 7 hours of running. Overall, these are great socks and I will continue to use them. The compression is good, comfort is great and durability is proven. There are small nitpicks with them but they definitely have a place in my sock drawer. 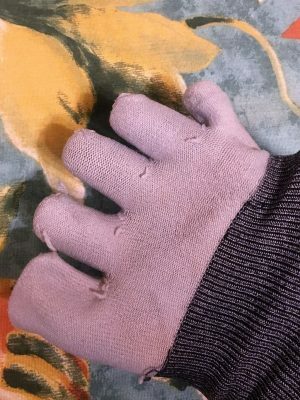 Thank you to 4alloutdoors.org and Injinji for providing the socks for this review.